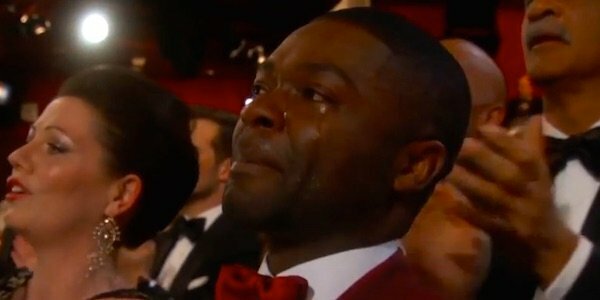 There were no doubt a handful of great moments from last night's 87th Academy Awards but none were as touching as the performance of "Glory" by John Legend and Common. The duo absolutely brought it all and then some for a rendition of their Selma track, one that audience members and home viewers certainly won't soon forget. Check out their powerful performance below. As you can see, the pair really soared to new heights with an epic showing of their now Oscar-winning track. From the moment Legend hits his very first notes and the lights go down, you can see something special is about to take place. As Common joined in to take the lead, marching in front of a Selma-themed set complete with the Edmund Pettus Bridge, the moment began to build. With Legend backing him up with his flawless vocals and keys, the two worked toward creating something very special... and in the end unquestionably delivered. The best part of the performance was saved for last as Legend belted out the final notes with Common by his side. The duo, backed by a huge group of vocalists, gave us all an amazingly epic musical moment. It's no shocker that the performance brought the Dolby Theatre crowd to their feet for a standing ovation. Both Common and Legend are excellent songwriters and performers in their own right so, when bringing the two together for a project like Selma (something the two both connect with), you are bound to get something great. The audience's reaction said it all, especially the select numbers that were so moved they couldn't hold back the tears. Naturally, Selma actor David Oyelowo was among them. 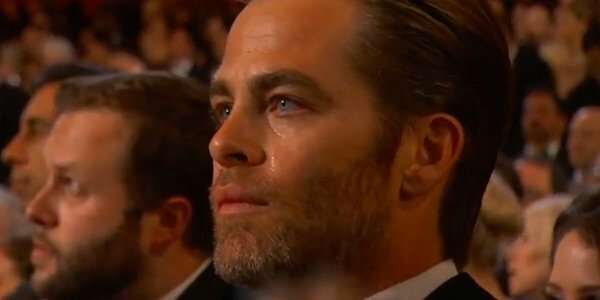 He wasn't the only one seen having an emotional moment, however, as a cameraman found Chris Pine (Into The Woods) in the crowd, also with tears streaming. While the moment was certainly one for the books, it didn't pinnacle until later that night when Legend and Common again found themselves up on the stage. This time, however, they weren't performing, but rather accepting the Academy Award for Best Original Song. Common proceeded to thank God before delivering a passionate speech about the unity brought together through the the Selma bridge, which he said "was built on hope." Legend then took to the mic for a few words of his own, declaring that while the events in Selma took place 50 years ago the struggle is just as relevant now. He closed things out, addressing everyone who connected with their song saying, "we are with you, we see you, we love you, and march on."